Not to be confused with Bokmål and Nynorsk, the two official written variations of the Norwegian language. 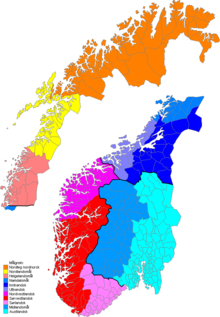 The Norwegian dialects are commonly divided into 4 main groups, 'Northern Norwegian' (nordnorsk), 'Central Norwegian' (trøndersk), 'Western Norwegian' (vestlandsk), and 'Eastern Norwegian' (østnorsk). Sometimes 'Midland Norwegian' (midlandsmål) and/or 'South Norwegian' (sørlandsk) are considered fifth or sixth groups. The dialects are generally mutually intelligible, but differ significantly with regard to accent, grammar, syntax, and vocabulary. If not accustomed to a particular dialect, even a native Norwegian speaker may have difficulty understanding it. Dialects can be as local as farm clusters, but many linguists note an ongoing regionalization, diminishing or even elimination of local variations. Normalized speech, following the written languages Bokmål and Nynorsk or the more conservative Riksmål and Høgnorsk, is not in common use, except in parts of Finnmark (where the original Sami population learned Norwegian as a second language), in much of østlandet, certain social groups in major urban areas elsewhere (e.g. Trondheim), in national broadcasting, and in courts and official decrees. Finnmark Norwegian Finnmark county, except for Northern Kautokeino, Northern Karasjok, Tana and Nesseby. Owing to geography and climate, Norwegian communities were often isolated from each other until the early 20th century. As a result, local dialects had a tendency to be influenced by each other in singular ways while developing their own idiosyncrasies. The community of Oppdal, for example, has characteristics in common with coastal dialects to the west, the dialects of northern Gudbrandsdalen to the south, and other dialects in Sør-Trøndelag from the north. The linguist Einar Haugen documented the particulars of the Oppdal dialect, and the writer Inge Krokann used it as a literary device. Other transitional dialects include the dialects of Romsdal and Arendal. On the other hand, newly industrialized communities near sources of hydroelectric power have developed dialects consistent with the region but in many ways unique. Studies in such places as Høyanger, Odda, Tyssedal, Rjukan, Notodden, Sauda, and others show that creolization has effected the formation of new dialects in these areas. Similarly, in the early 20th century a dialect closely approximating standard Bokmål arose in and around railway stations. This was known as stasjonsspråk ("station language") and may have contributed to changes in dialect around these centers. Until the 20th century, upward social mobility in a city like Oslo could in some cases require conforming speech to standard Riksmål. Studies show that even today, speakers of rural dialects may tend to change their usage in formal settings to approximate the formal written language. This has led to various countercultural movements ranging from the adoption of radical forms of Oslo dialects among political radicals in Oslo, to movements preserving local dialects. There is widespread and growing acceptance that Norwegian linguistic diversity is worth preserving. The trend today is a regionalisation of the dialects causing smaller dialectal traits to disappear and rural dialects to merge with their nearest larger dialectal variety. There is no standard dialect for the Norwegian language as a whole, and all dialects are by now mutually intelligible. Hence, widely different dialects are used frequently and alongside each other, in almost every aspect of society. Criticism of a dialect may be considered criticism of someone's personal identity and place of upbringing, and is considered impolite. Not using one's proper dialect would be bordering on awkward in many situations, as it may signal a wish to take on an identity or a background which one does not have. Dialects are also an area from which to derive humour both in professional and household situations. There are many ways to distinguish among Norwegian dialects. These criteria are drawn from the work of Egil Børre Johnsen (ed.) (1987) Vårt Eget Språk/Talemålet, H. Aschehoug & Co. ISBN 82-03-17092-7. These criteria generally provide the analytical means for identifying most dialects, though most Norwegians rely on experience to tell them apart. Infinitive ending with -e, e.g., å være, å bite, common in Troms, Finnmark, areas of Sogn og Fjordane and Møre og Romsdal, Southern counties, and a few other areas. The split distribution of endings is related to the syllable length of the verb in Old Norse. "Short-syllable" (kortstava) verbs in Norse kept their endings. The "long-syllable" (langstava) verbs lost their (unstressed) endings or had them converted to -e.
The original Germanic contextual difference between the dative and accusative cases, standardized in modern German and Icelandic, has degenerated in spoken Danish and Swedish, a tendency which spread to Bokmål too. Ivar Aasen treated the dative case in detail in his work, Norsk Grammatik (1848), and use of Norwegian dative as a living grammatical case can be found in a few of the earliest Landsmål texts. However, the dative case has never been part of official Landsmål/Nynorsk. It is, however, present in some spoken dialects north of Oslo, Romsdal, and south and northeast of Trondheim. The grammatical phenomenon is highly threatened in the mentioned areas, while most speakers of conservative varieties have been highly influenced by the national standard languages, using only the traditional accusative word form in both cases. Often, though not always, the difference in meaning between the dative and accusative word forms can thus be lost, requiring the speaker to add more words to specify what was actually meant, to avoid potential loss of information. Han kommer/kjem til å reise. Ka klokka e? (literally: What the clock is? ), or, using another word for clock, Ke ure' e? Å er 'o? (literally: What is she?). Old Norse had the diphthongs /au/, /ei/, and /øy/, but the Norwegian spoken in the area around Setesdal has shifted two of the traditional diphthongs and innovated four more from long vowels, and, in some cases, also short vowels. The Old Norse diphthongs /au/, /ei/, and /øy/ have experienced monophthongization in certain dialects of modern Norwegian. This shift originated in Old East Norse, which is reflected in the fact that Swedish and Danish overwhelmingly exhibit this change. Monophthongization in Norway ends on the coast west of Trondheim and extends southeast in a triangle into central Sweden. Some Norwegian dialects, east of Molde, for example, have lost only /ei/ and /øy/. (Jamning/Jevning in Norwegian) This is a phenomenon in which the root vowel and end vowel in a word approximate each other. For example, the old Norse viku has become våkkå or vukku in certain dialects. There are two varieties in Norwegian dialects – one in which the two vowels become identical, the other where they are only similar. Leveling exists only in inland areas in Southern Norway, and areas around Trondheim. In all but Oslo and coastal areas just south of the capital, the present tense of certain verbs take on a new vowel (umlaut), e.g., å fare becomes fer (in Oslo, it becomes farer). The /r/ is retained – most of Eastern Norway, the South-Eastern coast, and across to areas north and east of Stavanger. The /r/ disappears altogether – Southern tip of Norway, coastal areas north of Bergen, and inland almost to Trondheim. The /r/ is retained in certain words and in weak feminine nouns, but not in others – one coast area in Nordland. In areas north of an isogloss running between Oslo and Bergen, palatalization occurs for the n (IPA [nʲ]), l ([lʲ]), t ([tʲ]) and d ([dʲ]) sounds in varying degrees. Areas just south and southwest of Trondheim palatalize both the main and subordinate syllable in words (e.g., [kɑlʲːɑnʲ]), but other areas only palatalize the main syllable ([bɑlʲ]). Voiceless stops (/p, t, k/) have become voiced ([b, d, ɡ]) intervocalically after long vowels (/ˈfløːdə/, /ˈkɑːgə/ vs. /ˈfløːtə/, /ˈkɑːkə/) on the extreme southern coast of Norway, including Kristiansand, Mandal and Stavanger. The same phenomenon appears in Sør-Trøndelag[in which areas? The whole county?] and one area in Nordland. The geminate /ll/ in southwestern Norway has become [dl], while just east in southcentral Norwegian the final [l] is lost, leaving [d]. The same sequence has been palatalized in Northern Norway, leaving the palatal lateral [ʎ]. The second consonant in the consonant clusters /nd/, /ld/, and /nɡ/ has assimilated to the first across most of Norway, leaving [n], [l], and [ŋ] respectively. Western Norway, though not in Bergen, retains the /ld/ cluster. In Northern Norway this same cluster is realized as the palatal lateral [ʎ]. Although used less frequently, a subtle shift takes place in conjugating a masculine noun from indefinitive to definitive, e.g., from bekk to bekkjen ([becːen], [becçen], [beçːen] or [be:t͡ʃen]). This is found in rural dialects along the coast from Farsund to the border between Troms and Finnmark. Many people, especially in the younger generation, have lost the differentiation between the /ç/ (written ⟨kj⟩) and /ʂ/ (written ⟨sj⟩) sounds, realizing both as [ʂ]. This is considered to be a normal development in language change (although as most language changes, the older generation and more conservative language users often lament the degradation of the language). The functional load (the sum total of words that use this /ç/ - /ʂ/ distinction) is relatively small, and as often happens, similar sounds with small functional loads merge. There are great differences between the intonation systems of different Norwegian dialects. Oss, common in areas of Sør-Trøndelag, Gudbrandsdalen, Nordmøre and parts of Sunnmøre. E(g) and æ(i)(g), in which the hard 'g' may or may not be included. This is common in most of Southern and Western Norway, Trøndelag, and most of Northern Norway. Some places in Western Norway, it's common to say "Ej". ikke [ikːə] – Oslo, Kristiansand, Bergen, Ålesund, most of Finnmark, Vestfold and low-land parts of Telemark, and some cities in Nordland. ikkje [içːə/i:t͡ʃə] – most of Southern, Northern, Western Norway and high-land parts of Telemark. ^ a b Martin Skjekkeland. "dialekter i Norge". Store norske leksikon. Retrieved February 1, 2017. ^ a b c d e "dialekter i Setesdal - Store norske leksikon". Retrieved 4 January 2015. Authors state that the Setesdal dialect is "perhaps the most distinctive and most difficult to understand" among all Norwegian dialects. ^ To hear them pronounced, go to "Talemålet i Valle og Hylestad". Retrieved 4 January 2015. The section Uttale av vokalane needs to be selected manually. En norsk dialektprøvedatabase på nettet, a Norwegian database of dialect samples. This page was last edited on 1 April 2019, at 06:58 (UTC).